You and I sure have had our share of good times. I fondly recall the first moment I ever met you: it was at the Atlanta airport. I’d always heard about you, and was a little nervous to approach. You were everything everyone said you were and more. It was truly love at first bite. I told you I’d come back, and I did — time and time again. We met in various cities all over the country, each time better than the last, as if we’d never been apart. Isn’t that what true love is, where it picks up right it left off? You can imagine my excitement when I heard you were moving west to my city, Los Angeles. I’d be able to see you as much as I wanted, with no shame or recriminations. Our love would no longer have to be in secret. We could love out loud, for the entire world to see. I was in bliss, and for a time I was truly truly happy. I don’t understand why you’re jeopardizing what we have. You’re forcing me to choose between my heart and my stomach. Your president has said that you believe that a marriage is only between a man and a woman. But if anyone keeps eating at your establishment, the only relationship that’ll matter is between a man and his cardiologist. It’s not like anyone, gay or straight, is getting married in your restaurant — nor will any gay couple ever be serving fried food at their nuptials. You say that gay marriage is a sin, like in Leviticus 19:22. But a preceding verse, Leviticus 17:14, says, “You must not eat the blood of any creature, because the life of every creature is its blood; anyone who eats it must be cut off.” You don’t cook your chicken in a kosher way. On what grounds are you picking and choosing which edicts to follow? Is this all because your President, Dan Cathy, has both male and female names? I can see how that can lead to a confusion with one’s gender identity. But whether he’s transgendered, cisgendered, questioning, or in transition, he’s still one of God’s children deserving of empathy and compassion. Don’t get me wrong. I support Mr. Cathy’s right to think what he wants and vote however he sees fit. But like the Good Book says, we need sanctuaries in this world, places where a man can go to escape his thoughts. That used to be you. Now I have to wonder if I’m doing the right thing when I step inside your doors, if I am subsidizing perspectives that I am vehemently opposed to. Ignorance is bliss, girl, especially in your industry. Do you really want your customers to start thinking when they step foot in your doors? They’d run out of there faster than — and you’ll pardon the expression — a bat out of hell. They’ll go looking to put something healthier into the God-given temple that is their body. When have fast food and politics ever intermingled before? Arthur Treacher’s has never impressed sailors into the British navy, not even once. Burger King didn’t send his royal troops to support us in Iraq. Long John Silver has left his pirating days behind him, and now is a peaceful member of our community. Pizza Hut did not try to declare itself a Habitat for a Humanity. It’s not the gay community that is freaky, outspoken and different. It’s you, baby. You say that that’s a good thing, that you operate under your own rules. You point out that, unlike your rivals, you’re closed on Sunday. Isn’t it ironic that Sunday is the most socially segregated day of the week? We go to church, a place where everyone looks like us, talks like us and thinks like us. 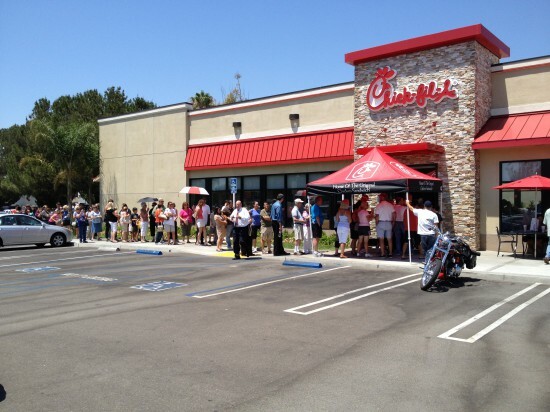 Not only is Chick-Fil-A closed on Sundays; but so are many hearts and minds. Apparently, you think this is a good thing. So Chick-Fil-A, baby, I guess what I’m struggling to say, as I fight back the tears and wipe the grease from my fingers, is this. It’s not that I don’t love you; we both know that’s not true. I know I’ll never find another like you. But baby, we are growing in two different directions. I’m afraid I won’t be able to see you anymore. PS – I would have written this on one of your fine napkins, but it was just too painful a reminder of the way we were.